Our society has little tolerance for crimes of violence. When a person is arrested for attacking another then Illinois prosecutors will aggressively pursue charges and Judges will have little patience in such cases. If you have been charged with assault and battery then you have options. 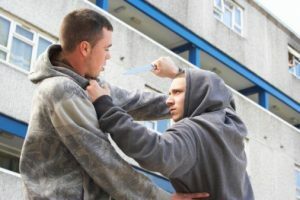 You may have been acting in self-defense, the situation may be a matter of mistaken identity, or you may have been acting in defense of another. If you find yourself facing such charges then you need to contact a lawyer as soon as possible. I am a Peoria criminal defense attorney who defends such cases and strives to provide a quality level of service. Contact my office today to schedule an initial consultation. It is a crime to strike someone or to put them in fear of harm. The blow does not have to be severe; simply shoving someone can result in battery charges. If the victim in the case is a romantic partner, a former romantic partner, or a relative then the case may result in domestic violence charges. Depending on the situation a defendant may be charged with a misdemeanor or with a felony. If a weapon is involved during the offense, such as a gun or a knife, then the accused will likely face enhanced felony charges. A conviction can result in incarceration, a criminal record, fines, and possibly the loss of your firearm privileges. The first step in an assault and battery case is to enter a “guilty” or “not guilty” plea at an arraignment. A trial date will then be set. Two things will happen between arraignment and trial. First, your counsel will conduct an investigation, interview witnesses, and visit the scene of the incident. Second, pretrial Motions will be filed with the Court to request that wrongfully taken statements be excluded, that unreliable in-court identifications not be allowed, and that other evidence be suppressed. The case will conclude at a trial where the jurors will decide guilt and, in the event of a conviction, the Judge will issue a sentence. To face such charges is a serious situation and it is crucial that you hire an attorney to assist you. I am a Peoria, Illinois criminal defense lawyer who handles assault and battery cases. I will use your initial consultation to hear your side of the story. Once retained, I will conduct an investigation and visit the scene of the incident. I will work to establish a claim of self-defense if it is feasible, will file to exclude statements taken in violation of you Miranda rights, and will aggressively examine police officers at any evidentiary hearings. As an attorney, I will ensure that you know what to expect at trial, will prepare you for the process, and will protect your rights from start to end. I am ready to assist you. Contact my office today. If you are charged with assault and battery then you can expect the prosecution to show no leniency. It is important that you retain quality representation. I am a former prosecutor with over twenty years of legal experience. In addition to being familiar with the local court system, I also provide a high level of service. I will promptly return phone calls, quickly respond to your emails, and will make myself available to answer your questions. I believe that the accused are entitled to as much and this is my promise to each and every client.